Eugenios Yiannoulis was born in the village of Megalo Dendro of Trichonida near Patras in 1597. At a young age he went to the Monastery of Panagia Vlochou in Agrinio. He then fled to the Monastery Trovatou in Agrafa, where he associated with virtuous elders and increased grammatical knowledge. At the age of seventeen he became a monk and after two years was ordained a deacon in the Monastery Tatarna in 1616. With his elder Arsenios he visited Mount Athos. Eugenios formed a relationship with the scholarly and virtuous bishop Haralambi in Xeropotamou Monastery. Elder Arsenios departed for Jerusalem, and after a long time Eugenios learned of his death. He returned to the Monastery Trovatou. Mount Athos was nostalgic in his memory. Afterwards he visited Alexandria, where he was ordained a priest by Patriarch Cyril Loukaris of Alexandria at Sinai Monastery in 1619. He served his first Divine Liturgy at the church of the Panagia on the peak of Mount Sinai. From there he went on a pilgrimage to the Holy Land, where he served as a priest in the patriarchal chapel of Saint Constantine from 1619 to 1622. He returned to his homeland and remained in the Monasteries Vrangianon, Varnakova and Tatarna. 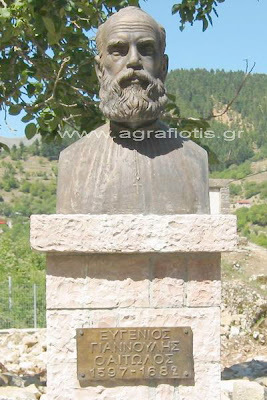 As a lover of studies he pursued education in Trikala, Kefallonia and Zakynthos from renowned teachers, including Theophilos Corydalleus. In 1636 Corydalleus was appointed by the Ecumenical Patriarch Cyril Loukaris to the Great School of the Nation, and he took with him Eugenios, who served as priest at the Church of Saint Kyriaki Kontoskaliou. In Constantinople he studied under Meletios Syrigos for a short time, but then returned to Corydalleus. While in Constantinople Eugenios witnessed the persecution against Patriarch Cyril Loukaris, and admired him for his unrelenting spirit. Following the martyrdom of the Patriarch, he promoted his canonization and wrote a Service in his honor. Eugenios came to the point that he was even deposed by the Turkophile and Latin-minded Patriarch Cyril Kontaris, who replaced the Orthodox Patriarch Cyril Loukaris, but later, in 1639, Patriarch Parthenios I restored him triumphantly. 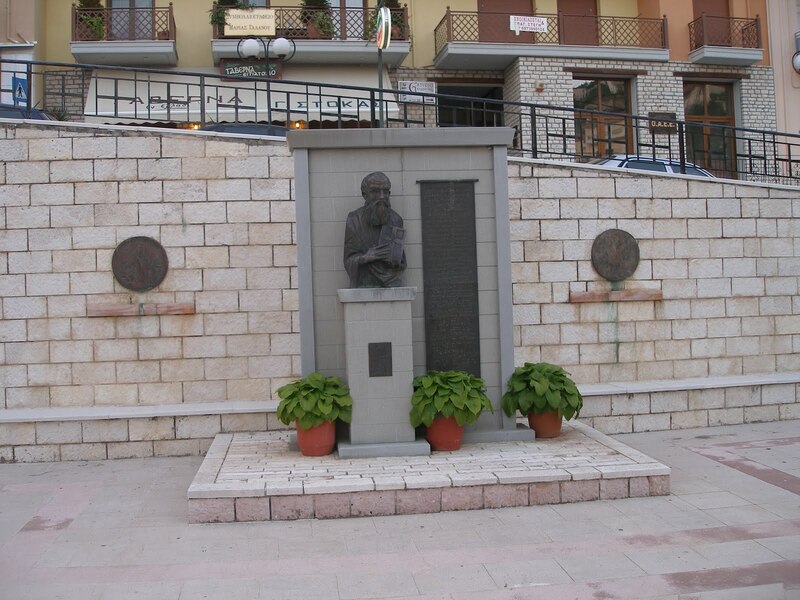 He founded schools and taught in Arta (1639-40), Aetoliko (1641, where he was imprisoned by the Turks), Messolongi (1641-45), Agrinio, Karpenisi (where he built a large church to the Holy Trinity and a school of higher learning), and the Monastery of Saint Paraskevi in Vrangianon, Euratania which he founded in 1661. In 1674 he returned to his school in Karpenisi until 1675. After wandering through Nafpaktos, Mesolongi, Aetoliko and the Monastery of Tatarna, he returned to Vrangianon where he taught until 1680. He acquired many good students, who in turn excelled and established schools themselves. He built churches, preached constantly, wrote many letters - around five hundred, and engaged in writing and hymnography. 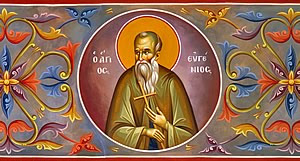 He reposed in prayer, being aware of his impending end, on 5 August 1682 in Vrangianon Monastery of Saint Paraskevi, surrounded by his beloved students. He was entombed in the narthex of the katholikon. His biographer was his faithful disciple, the Hieromonk Anastasios Gordis (1703). 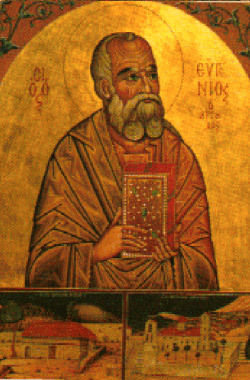 The recognition of Eugenios as a saint came by the Ecumenical Patriarchate on July 1, 1982. 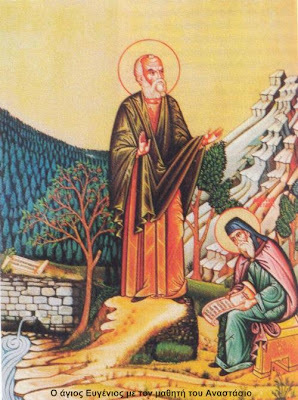 A full Service of Praise was produced by the monk Gerasimos Mikragiannanitis. The entire work of St. Eugenios manifests his great love for God and the people. He was a tireless worker in difficult spiritual times for the Greek Nation, a virtuous teacher and an illuminator. His rhetorical skills, education, vast memory, courage, dedication and outstanding commitment helped rectify his enslaved brethren. In Karpenisi there are two chapels dedicated to him. His memory is celebrated on August 5th. 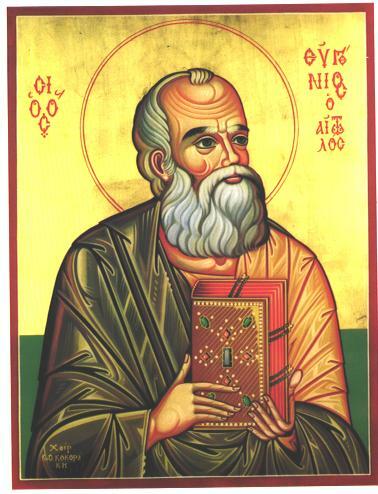 In the Spirit you were shown to be a divinely-inspired teacher and guide of the faithful, servant of Christ, Venerable Eugenios, you were distinguished in speech and luminous in life, and seen as a practical interpreter of piety, for which the Church blesses you.